Does this patient have salicylate intoxication? There were 19,814 reported intoxications with salicylates and 20 deaths which is approximately 1% of all exposures and 2% of all deaths reported to the Natonal Poison Data System (NPDS) in 2009 (Figure 1). Salicylates are found in many commonly used medications including aspirin and aspirin containing medications, topical lotions and oil of wintergreen. There have been reports of salicylate toxicity and in rare instances death from sports creams that contain methyl salicylate also known of oil of wintergreen. Many preparations have enteric coating which slows absorption to over 12 hours. Toxicity usually develops with ingestions greater than 150 mg/Kg, with serious toxicity in ingestions of 300 – 500 mg/Kg. The most common salicylate is acetylsalicylic acid (ASA) or aspirin. Acetylsalicylic acid is converted to salicylic acid in the gastrointestinal (GI) tract. The absorption of both ASA and salicylic acid is usually rapid but can be delayed with enteric coated medications and large ingestions. Concretions or clumps of ASA tablets can form in large ingestions and significantly delay absorption. Salicylic acid is responsible for all of the toxic effects of ASA ingestion. The Vd depends on the amount ingested. At pharmacologic doses, binding to albumin is high, which keeps the compound extracellular and the Vd low (0.2 L/kg). With overdoses, the protein binding is saturated and the Vd increases to 0.4 L/kg or greater. The distribution of salicylic acid is also pH dependant. Only the non-ionized form can penetrate the cell membrane and therefore when the systemic pH falls and more salicylate is in the form of salicylic acid, there is a greater distribution into the cells. This is very important clinically since salicylate causes its major toxicity once it is intracellular. The metabolism and excretion of salicylic acid is also concentration dependent. The enzymatic metabolism of salicylic acid is saturable and at high levels, most of the removal is then due to excretion of salicylic acid in the urine. The excretion of salicylate is pH dependent as well. Alkalinization of the urine increases the ionized form of salicylate which is then unable to diffuse out of the urine back into the tubular cell. Figure 2 lists the most common findings in salicylate intoxication. The symptoms of salicylate intoxication differ according to the age of the patient and whether the intoxication is acute or chronic. Most people will have some clinical effect of intoxication with serum levels > 40 mg/dL. In chronic intoxication and in the elderly, symptoms will occur at lower levels. 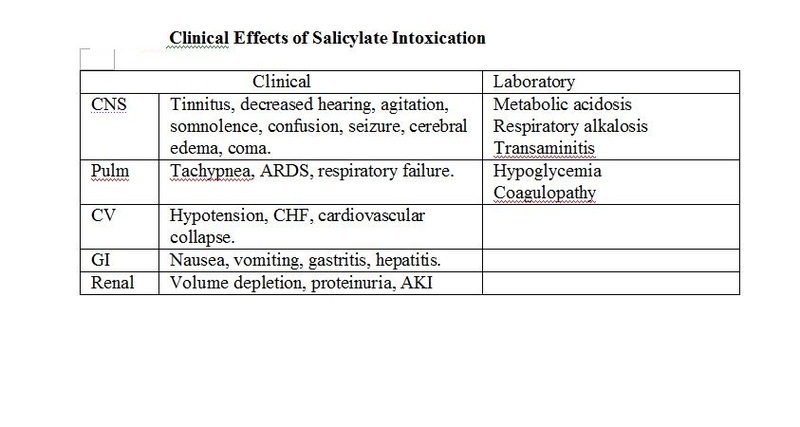 Clinical effects of salicylate intoxication. The common symptoms in all settings are nausea, vomiting, tachypnea, tinnitus, stupor, coma, and convulsions. In severe intoxication, patients can develop kidney and respiratory failure, cardiovascular collapse and coma. Prognosis is not well correlated with serum levels and can be better estimated by the degree of hypotension, mental status changes, acidosis and respiratory failure. The more severe complications of intoxication including respiratory failure, renal failure, seizures, coma and death were all more likely in the elderly and in chronic ingestions. The central nervous system (CNS) toxicity from salicylate poisoning is thought to be due to a number of factors including cerebral edema, cerebral hypoglycemia and cerebral white matter damage. The acidosis is due to uncoupling of oxidative phosphorylation in the Krebs cycle and accumulation of lactic acid and ketoacids. Hyperventilation occurs from direct stimulation and can lead to a respiratory alkalosis. Children are more likely to demonstrate fever and severe metabolic acidosis, whereas adults are more likely to experience noncardiogenic pulmonary edema, especially those with a history of smoking. How should patients with salicylate intoxication be managed? Activated charcoal is effective in reducing the gut absorption of salicylate in acute intoxication. Activated charcoal is recommended for all patients who present within 1 hour of a potentially toxic salicylate ingestion. It should also be considered for patients who ingest enteric coated preparations or who have rising serum levels suggesting continued absorption. For these patients, repeated doses of activated charcoal may be beneficial if the level continues to rise. The dose is 50 gm in adults or 1 gm/kg in children. As described above, renal excretion is very important at toxic serum salicylate levels as the enzymatic metabolism is saturable. Reabsorption of salicylate in the proximal convoluted tubule depends on the urine flow rate and urine pH. In an alkaline environment, salicylate is ionized. For this reason, urinary alkalinization can increase the renal clearance significantly through ion trapping. Sodium bicarbonate can be used to increase serum pH and raise urine pH to > 7.5. Many patients present with volume depletion and the solute load will restore volume and therefore help maintain urine output as the bicarbonate helps to maintain a high urine pH. See Table I for the method in urine alkalinization. Forced diuresis does not appear to increase clearance and may lead to volume overload and worsen electrolyte disturbances. The use of acetazolamide should be avoided since it can increase the risk of systemic acidosis. As described earlier, salicylate distribution to tissues and therefore toxicity is dependant on serum pH. The concentration in the CNS will increase as the serum becomes more acidic. This concept helps explains the importance of treatment with sodium bicarbonate or hemodialysis to correct acidosis. Patients often present with respiratory alkalosis which helps protect the serum pH. Patients with salicylate intoxication benefit from their salicylate induced hyperventilation and subsequent respiratory alkalosis. Rapid neurologic deterioration and death has been described in patients who became more acidemic in the setting of initiation of mechanical ventilation. Care must therefore be taken with any form of sedation or mechanical ventilation to maintain the respiratory alkalosis as much as possible. Glucose should be added to the intravenous fluid (IVF) because both hypoglycemia and low CNS glucose levels without systemic hypoglycemia are common in salicylate poisoning and can worsen its CNS toxicity. Salicylates have a small Vd (0.21 L/kg), a low molecular weight (138 D), but a fairly high degree of protein binding at therapeutic levels (about 80 – 90%). These characteristics would suggest that hemoperfusion would be the best extracorporeal therapy for salicylate intoxication. However, protein binding is saturable and declines with toxic levels to around 30 – 50%. Concomitantly, the Vd increases (to ≈ 0.35 L/kg) with toxic levels since the unbound drug is no longer trapped in the vascular space. With toxic salicylate levels, therefore, hemodialysis is as effective as hemoperfusion at removing the compound. Hemodialysis is the preferred method because of the inability of hemoperfusion to correct acid-base and electrolyte disorders and volume disturbances. The correction of the acidemia can have a rapid clinical effect as pH rises and the salicylate becomes ionized and can no longer diffuse into the cells. Since serum levels correlate poorly with toxicity, the serum level should not be the major criteria for hemodialysis. Hemodialysis should be considered for patients with signs of salicylate toxicity and have either a known ingestion of salicylate or a toxic serum salicylate level. Indications would include refractory acidosis, declining neurologic status, seizures, Acute respiratory distress syndrome (ARDS) or pulmonary edema, circulatory collapse and acute kidney injury. Serum levels that would be expected to lead to this degree of toxicity are > 100 mg/dL in acute ingestion and as low ≈ 60 mg/dL in chronic ingestion and the elderly. Figure 3 displays the indications for hemodialysis in salicylate intoxication. Since the major excretory pathway for salicylates with toxic levels is via glomerular filtration, patients with either acute or chronic kidney disease may need hemodialysis at a lesser degree of toxicity or serum level as compared to patients with normal kidney function. Indications for dialysis in patients with salicylate intoxication. The aim of the hemodialysis prescription is to maximize clearance of salicylate. With this in mind, a large dialysis filter with high dialysate and blood flow rates should be chosen. Dialysis should be continued until the following conditions are met: (1) the serum salicylate level drops to the therapeutic range, (2) resolution of acidosis and (3) improvement in symptoms of intoxication. Required dialysis times can often be prolonged. What happens to patients with salicylate intoxication? The common symptoms in all settings are nausea, vomiting, tachypnea, tinnitus, stupor, coma, and convulsions. In severe intoxication, patients can develop kidney and respiratory failure, cardiovascular collapse and coma. Prognosis is not well correlated with serum levels and can be better estimated by the degree of hypotension, mental status changes, acidosis and respiratory failure. The more severe complications of intoxication including respiratory failure, renal failure, seizures, coma and death were all more likely in the elderly and in chronic ingestions. The CNS toxicity from salicylate poisoning is thought to be due to a number of factors including cerebral edema, cerebral hypoglycemia and cerebral white matter damage. Yip, L, Dart, RC, Gabow, PA. “Concepts and controversies in salicylate toxicity”. Emergency Medicine Clinics of North America,. vol. 12. 1994. pp. 351-364. Herres, J, Ryan, D, Salzman, M. “Delayed salicylate toxicity with undetectable initial levels after large-dose aspirin ingestion”. American Journal of Emergency Medicine. vol. 27. 2009. pp. e1171-1173. Glisson, JK, Vesa, TS, Bowling, MR. “Current management of salicylate-induced pulmonary edema”. Southern Medical Journal,. vol. 104. 2011. pp. 225-232. Temple, AR. “Acute and chronic effects of aspirin toxicity and their treatment”. Archives of Internal Medicine,. vol. 141. 1981. pp. 364-369. Krause, DS, Wolf, BA, Shaw, LM. “Acute aspirin overdose: mechanisms of toxicity”. Therapeutic Drug Monitoring,. vol. 14. 1992. pp. 441-451. Bronstein, AC, Spyker, DA, Cantilena, LR, Green, J, Rumack, BH, Heard, SE. “2009 Annual Report of the American Association of Poison Control Centers' National Poison Data System (NPDS)”. Clin Toxicol (Phila);. vol. 45. 2009. pp. 815-917.